It probably comes as no surprise to those living in the Great Lakes region to hear that this spring was one of the coldest on record. Since 1948, there have been only four years with lower spring temperatures. And these unusually cold temperatures—and the snow that came with them—had significant impacts on Great Lakes ecosystems, communities, and economies. These impacts are the focus of the latest edition of the Great Lakes Quarterly Climate Impacts and Outlook report. Released in June, the report details how the long winter helped lake levels rebound from record lows, forced cities to invest more in winter operational expenses and infrastructure maintenance, and has left some farmers concerned about this year’s crop. It also provides a look at expected temperatures and precipitation levels for the coming months. 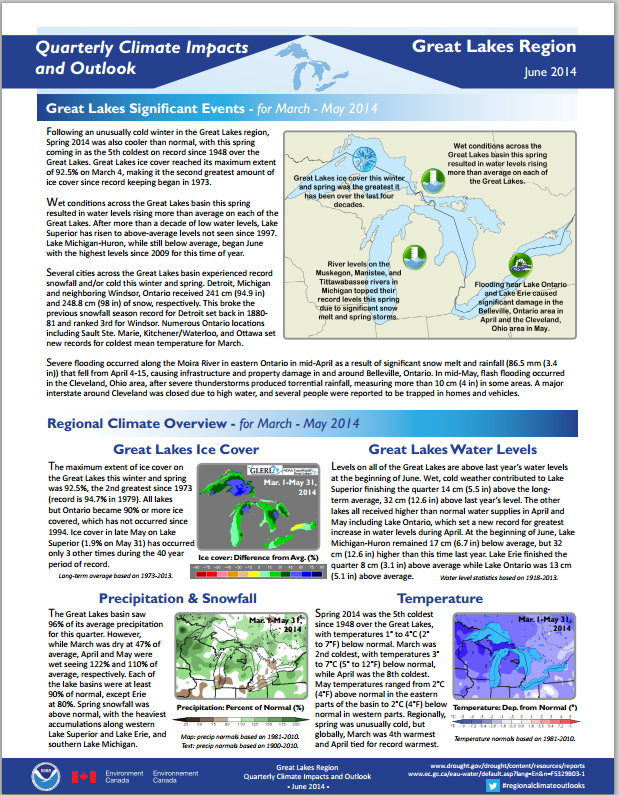 The Great Lakes Quarterly Climate Impacts and Outlooks is developed by NOAA and Environment Canada. Past editions, as well as reports for other regions, are available at the U.S. Drought Portal.